Good evening from super caffeinated Orange County everyone! This is one amped Newport Beach Wedding Photographer that has a really cute family portrait photo shoot to share with you. Before I share this family portrait with you, I’ve got to share some other things that are happening in Newport Beach at Esquire Photography HQ. Over the weekend I shared on Twitter & Facebook two very HUGE announcements. One of which is the Military Promotion that launched on Saturday. I had the honour of giving it to Ali & Justin when I was up at Edward’s Air Force Base with both of their parents location scouting and going over details for their Lancaster Wedding Day I’m photographing for them next August. The other HUGE announcement I shared was the Workshop I’m teaching with my good friend & fellow photographer Danny in Paris France. Can I just say; “Wholly Nachos & Newcastles!” So if you’re in Paris over Christmas break, totally let me know because the workshop is very affordable & only 100 Euros per person. A few years ago, I had the honour of photographing Stephanie & Lester’s gorgeous and romantic La Habra wedding. Their wedding day was a blast & since then – we’ve all kept in touch and wouldn’t you know it – they had a little baby girl recently with the cutest nick-name; “Baby G.” I love Love LOVE it! Baby G is a totally MEGA cute little “Scooby Snack” too. But even more fun is she has Lester wrapped right around her little teensie weensie fingers. She’s definitely the sparkle in both her parent’s eyes! We had a lot of fun for their family portraits and as I was sorting them out, I couldn’t decide which two or three to share with you – so I put together a slide show with a nice collection of my favourites from their photo shoot. But before you scroll down to check out their slide show video and you’re thinking… Hey – I’d really like to share some Nachos & Newcastles (My favourite snack!) and get to know this Newport Beach Wedding Photographer (Previously a Huntington Beach Wedding Photographer) that loves music & fashion, photography and art, feel free to contact me anytime. I hope you’re having a great start to your holiday season & stay in touch for some more absolutely incredible events that I’m sharing this week. From Newport Beach to San Diego, Ventura and all the way up to Oakland – I’ll have some fantastic Weddings and events that I’ve had the honour of photographing. And of course soon to come; the party at LA Fashion Week with the Kate Mesta Crew and be sure to check out the Huntington Beach Portrait Photo Shoot of Sarah for her portfolio for The Ford Modeling Agency – Cheers! PS, Check out this awesome quote I shared on Twitter keeping the “Butterfly Effect” moving forward – spreading positivity. It’s a totally new one & I really think it is so very true. “Ability is what you’re capable of doing. Motivation determines what you do. Attitude determines how well you do it.” — Lou Holtz. PSS, Totally check out the MEGA announcement from Duran Duran on today’s West Coast Wednesday Video Of The Week. You’ll love it! 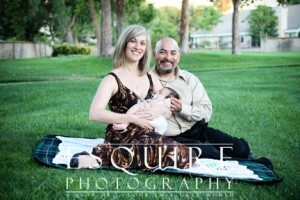 to show some love for Stephanie, Lester & Baby G’s family portraits!